Starting from Apr 1st 2018, UWTC-REC6 receiver has been discontinued. As a possible upgrade, please check UWTC-REC2 and WRS232 or contact our customer engineering for details. 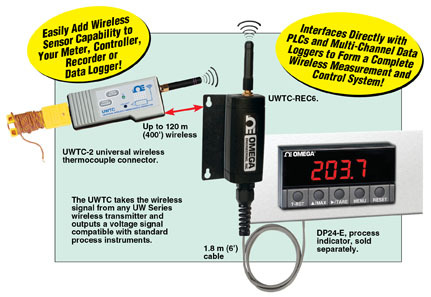 Complete Wireless Measurement and Control System! With OMEGA’s new universal wireless transceiver modules you can eliminate the wire connection between your sensor and instrument. 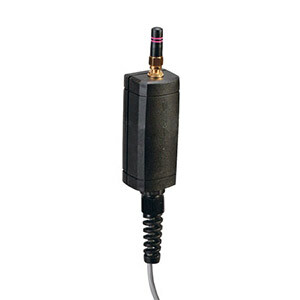 Simply connect this transceiver to the analog input on your instrument and you’ll be able to receive wireless measurements from many different wireless sensors including OMEGA’s patented wireless thermocouple and RTD connectors, pH, infrared temperature, relative humidity, process input transmitters and our NB9 Series of industrial wireless probe/transmitter assemblies. Both models are packaged into a miniature housing for easy mounting and connection. This receiver provides stable, reliable wireless reception from your sensor.